Chelsea Gray’s strength enabled her to power to the rim against three Lynx opponents Sunday and score the winning basket. Photo by Adam Pantozzi/NBAE via Getty Images. Minneapolis – That it was another last-second shot after a volatile game that propelled the Los Angeles Sparks past the Minnesota Lynx Sunday wasn’t a surprise, given the history of the series between the two teams. The fact that it was Sparks guard Chelsea Gray who pulled the trigger once again was the shocker. 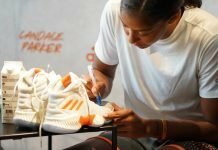 She made a last-second shot at the buzzer of last year’s Finals Game 1, in eerily similar fashion to the dagger she threw up in the 2018 season opener for both teams. 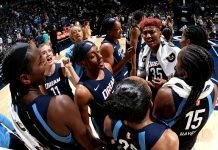 A game that featured 14 lead changes, nine ties and four technical fouls came down to the last 5.8 seconds, when Lynx point guard Lindsay Whalen hit a pair of three throws to give her team a 76-75 lead, after being down by as much as ten points in the third quarter. Gray then drove the ball into the lane and hit an off-balance jumper as time expired, handing Minnesota their first season opening loss since 2011 – the year they won their first title. It was a dramatic rematch of last season’s Finals, which saw the Lynx prevail in Game 5. 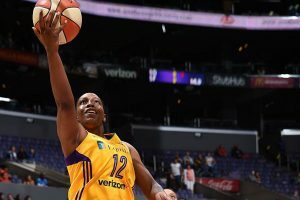 Los Angeles forward Nneka Ogwumike, who scored 19 points on the night, said last year’s loss was their offseason impetus. Odyssey Sims led the Sparks with 21 points, Gray had 18 and Essence Carson, 11. 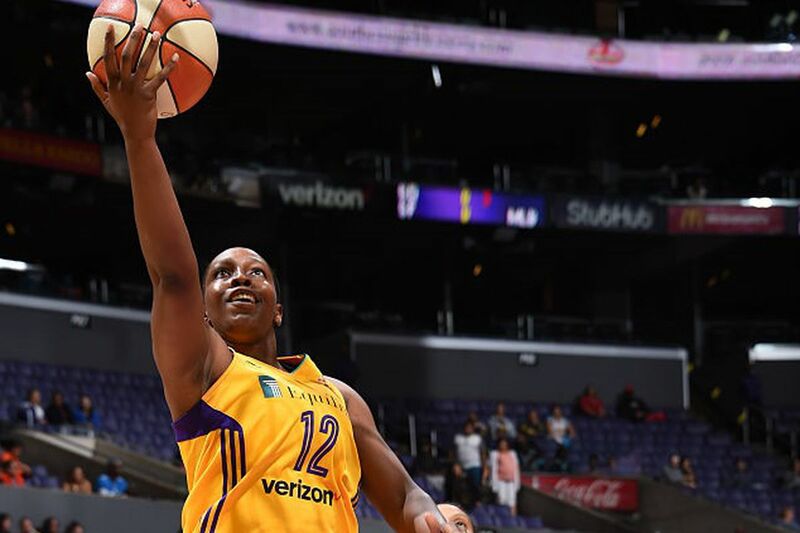 The win was all the more impressive since All-Star Candace Parker was out with an injury, and forward Jantel Lavender is still playing overseas, which left Ogwumike as the only post player. The seventh-year veteran said her focus was staying out of foul trouble. Minnesota turned the ball over an uncharacteristic 24 times, which the Sparks capitalized upon. And the fact that they didn’t take advantage of the mismatch in the post riled coach Cheryl Reeve. The rivalry hit a peak with 8:09 left in the game when Whalen and Sims got into an argument on court, which earned them each a technical foul. Reeve and Sims got into a shouting match – the second double-technical of the day. Los Angeles had a five-point lead with 2:08 remaining. Sylvia Fowles, who finished with 15 points and 12 rebounds for the hosts, hit two free throws at the 56-second mark to bring the Lynx within one, 73-72. Sims answered with a long jumper, and Whalen hit four consecutive free throw shots to set up the final stanza – the ending of which drained the energy of the sold-out crowd of 13,062. Whalen had 17 points for Minnesota and Rebekkah Brunson, 15. Carson said personnel absences didn’t phase the Sparks. Lynx forward Maya Moore said the team would take lessons from the loss. The rivalry between the two teams had been lively and competitive during the Reeve era, but it accelerated in 2016. That year, the Sparks won the WNBA Finals on a Game 5 buzzer-beater by Ogwumike. The total points in that series were 391-386, with the edge for Minnesota. In 2017, it was the Lynx turn to shine, and again in Game 5, it came down to the wire. This time, it was Moore who clinched the win. The competitive new chapter to the rivalry started Sunday morning at Los Angeles’ shoot around, when the video of the ring ceremony began playing on the projection screen that was brought out for the evening festivities. 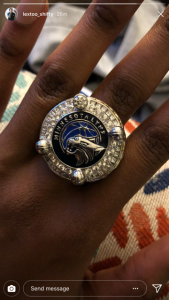 The Sparks players weren’t planning on watching the ceremony live that evening, so Minnesota wanted to make sure they got a sneak peek. Reeve spoke with KFAN FM 100.3’s Dan Barreiro on-air about the same time the celebration video was playing, and she talked about the intense rivalry between the two teams and how both of them had each won a championship the last two seasons. She was hesitant to use the word “hate” early in the interview, but as the interview drew near the end, Reeve let it slip. Nine hours later Reeve sat in the postgame press conference hating the fact that her team had so many turnovers, and that the visitors controlled the paint. Alexis Jones shows off her Championship ring. Photo by Alexis Jones. The happy moment for the Lynx franchise was the pregame ring ceremony and championship banner raising. 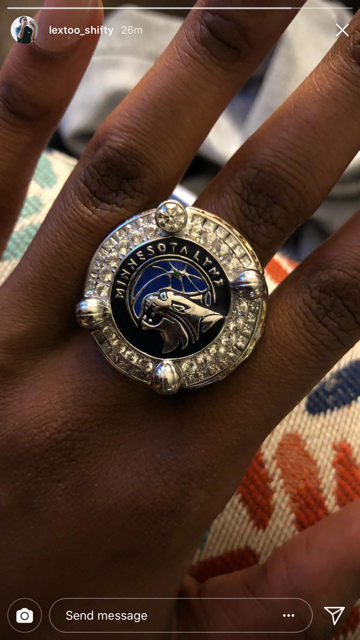 Along with explosives, loud music and an incredible video by the Lynx game ops, the team also welcomed former teammate Plenette Pierson back to receive her ring. Pierson, now retired, surprised players pregame, and was bombarded with hugs by players and the coaching staff. WNBA President Lisa Borders was also in attendance, passing out the rings to the players before the game.